The Welfare had Darts teams, Dominoes teams and later a Pool team, but the main interests for us was the Football team. 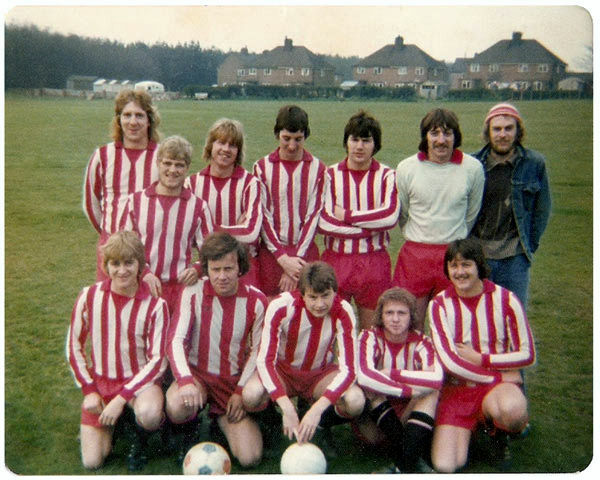 Through the years many a good team had played under the Annesley name but we started our own in 1976, instigated by David Johnson. We just wanted a team of locals or miners not imported Pot Hunters from other teams. And so it was formed and went by the name of Annesley Welfare Athletic FC. We scraped together enough money to buy a kit and a ball. We washed our own kit every week and eventually the club went from strength to strength. "Roey pick their centre half up on the edge of the box"
Yes we enjoyed every minute , burrghhh. Annesley had its fair share of cricketers who graced the pitch where as kids we daren't even breathe on. Fathers, sons and brothers wore the whites on sunny summer afternoons then later discussed their results over a pint. Darts matches always pulled a decent midweek crowd and if you didn't buy a raffle ticket you got offered the sandwiches last, when the corners were turning up. A bowling green and tennis courts eventually were overrun by weeds and I don't think we really appreciated what was at our disposal but back in the day proud participants loved their time together away from the dark dusty coal faces where we made a living. Work together and play together, work hard and play hard. It has been a centre for many generations as a meeting place or a drinking place. I even met my wife at Annesley Welfare. Julie came from Newstead and we had been trying to arrange a date but due to a busy Nottingham Forest fixture list I had not fulfilled my promises. It was Friday night before the Reds were to play Liverpool at Wembley in the League Cup Final and a couple of Newstead lads said we've had to give Julie a lift up here as your date was called off again. Then we actually met in person in the tap room. The lads left us to it and as I went to the bar Julie offered to buy my drink! That's when I knew she was the girl for me but unfortunately there was a matter of the Wembley trip tomorrow. This delay didn't put her off and we kissed on the steps for the first time with a promise to meet up during the week down at Newstead Welfare. We have now been married for 26 years and when I find Kev who brought her up for that first meeting he's getting it. (Only joking Julie). There have been many memories for many folk who frequented the place as miners or thereafter. Some bizarre, when they didn't renew the liquor license and once when certain folk served time for Her Majesty for fiddling. I did my bit to undermine it as well on 74's coal face at Newstead which left subsidence and all the windows had to be taped up. Taking the ground from underneath it in the daytime and drinking there at night, weird. I and my mates became accomplished Solo players during the 1974 strike when the beer price was lowered to 10p a pint to keep the place going as our monies ran out until Edward Heaths government buckled. It was a shame when the union split for the 1984 strike; some wounds never healed and it broke the spirit nearly as much as the pit closures themselves. Was it Phil Naylor changing the channel on the new remote controlled telly (they had a similar set at home) confusing the Saturday dinner time racing enthusiasts? And Phil Naylor swapping the black ball on the snooker table for the knob from the one armed bandit and Jack Staples threatening to kill him, we all ducked then he feigned his throw and kept hold of the knob pheww. Learning how to play Killer on the dart board and on the snooker table by Phil Naylor, during the strike. Yes you're right he was a regular in there. Bingo played a big part as did the Sunday Night Tote, nice to come away with more than you went out with now and again. All in all in days gone by there was never a dull moment as miners from both Annesley and Newstead quenched their thirsts and made merry, swapped tales of their daily work, picked the Forest or Notts teams for next Saturday and so on. We planned meticulously our Munich and Madrid European Cup trips over a pint in the Welly and I mostly got talked into a lot of England matches and away games as the beer took effect. Only ghosts will whirl around the hardwood floor doing a Fox Trot or Waltz, Christmas kisses and punches around the ear hole will just be memories; potential sportsmen will never emerge as home grown; memories will eventually be a thing of the past. The one armed bandit's reels will not show a line of Bells but R I P.